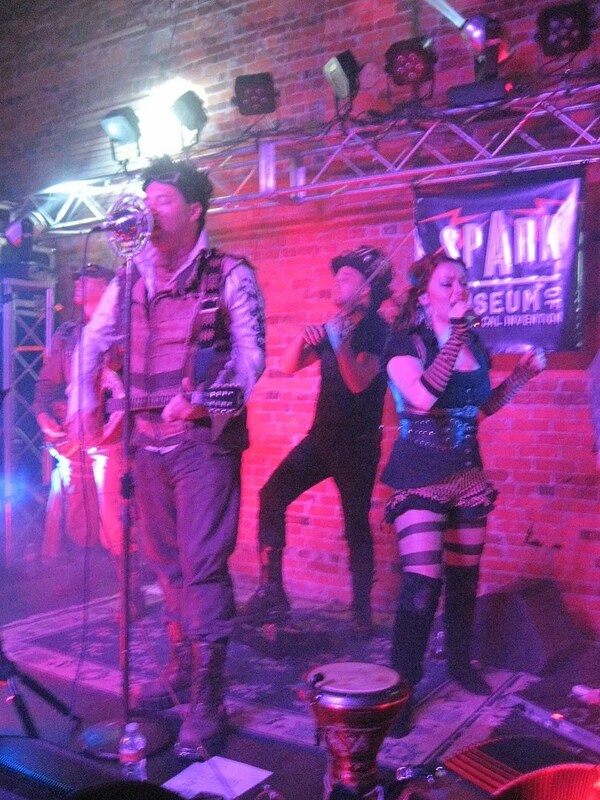 This weekend I attended another Abney Park concert. I think it’s my SIXTH, and this one was absolutely wonderful. Definitely my second favorite (my first favorite will always be my first AP concert.) The energy was just electric, and everyone was having such an awesome time. Whenever I looked around, there was the biggest smile on everyone’s face. 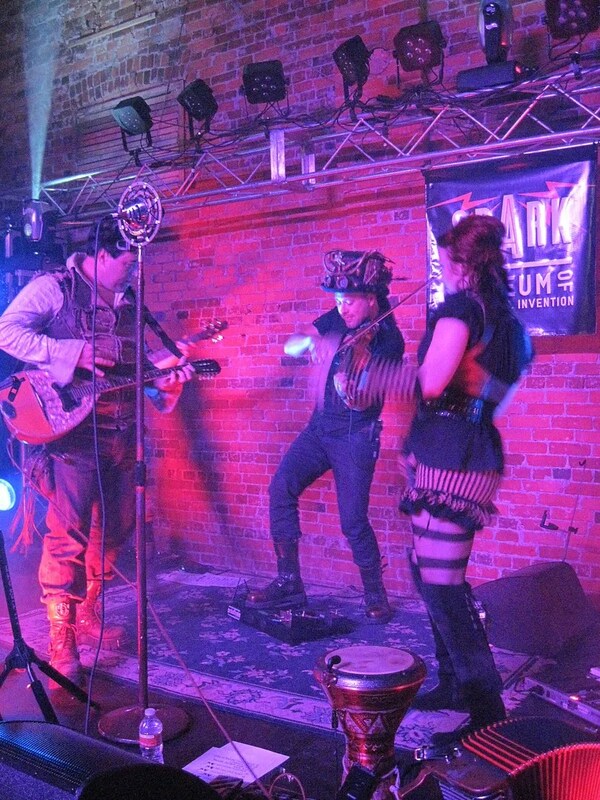 The venue itself was amazing – it was the first live performance ever at the Bellingham Spark museum, and what perfect surroundings for steampunk! Before the concert we toured the museum, and there were tons of cool displays, many interactive. The opening band was Adrian H and the Wounds. I enjoyed their music, although probably not well enough to buy a CD. But then Abney Park came on stage. And wow. This was my first time seeing the new guys in person (Josh and Titus replacing Nathaniel who left to start his own band.) They couldn’t match Nathaniel’s flamboyance (who could?) but they were excellent musicians and nicely interactive with the crowd, as are all the other band members. During several songs one or more of them would jump off the stage and come play, sing, or dance with us. As always, I try to film more of the between-songs moments, rather than the songs themselves! For one thing, I am always pressed up against the stage, as close as I can get, and my camera doesn’t record sound well when I’m that close to the equipment. For another, I love the between-songs moments…you never know what you’re going to get! Between AP sets, the museum put on a Tesla coil demonstration. Very cool. It was amazing to see light bulbs lighting up just from being held close to the coil! Unfortunately for AP, this demonstration fried their computer’s motherboard – but it wouldn’t be an AP concert if something didn’t break/go horribly wrong. It’s all part of the fun, as Jody led a raid on the bar while Robert was trying to save the computer. The problem was solved, and the concert continued to its glorious ending….far too soon. After the show, I met up with Robert and got him to sign my copy of his book The Wrath of Fate to me. I’d ordered a signed/numbered copy of his book the instant it was released, and had been surprised that I’d gotten copy #2 out of 300. Robert was impressed with my purchasing prowess; so impressed that he called Kristina over to see it. She said she was always afraid she was going to screw up the numbers when she was writing them in, and he said he was always afraid that the #2 book was going to get lost in the mail, and then what would he do? Send out another and say “Here you are – another #2!! !” I had him sign the book to my nickname “Lis” and he said that was his sister’s name, and he’d never met another person called that. So that was cool, too. And of course I got a pic with him. 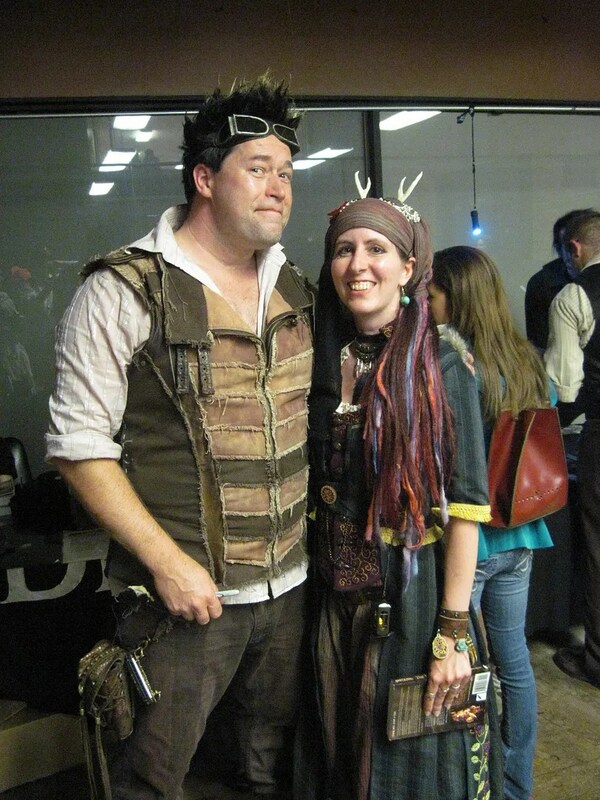 I’m wearing my Steampunk NeoBedouin costume – which is actually based off the description in Robert’s book. I had meant to tell him that, but we were so busy talking about other things, that I never got around to it. As much as I would’ve enjoyed it, I couldn’t monopolize him all night! There is more about my costume, including more pics and a making-of, here, here, and here, on my costuming blog. The costume did get recognized several times by fellow fans who would come up to me and shout “NeoBedouin!!!!”. Which was awesome. All-in-all, it was a fantastic night, and it definitely will not be my last AP concert.